This recipe is egg-free (if that is of interest to you), and is a fun one to make with the kids. They’ll love the magic! I can’t remember where this recipe came from, but I’ve had it for years and recently rediscovered it. (All powder ingredients should be sieved). 1) Heat oven to 350F, 180C. 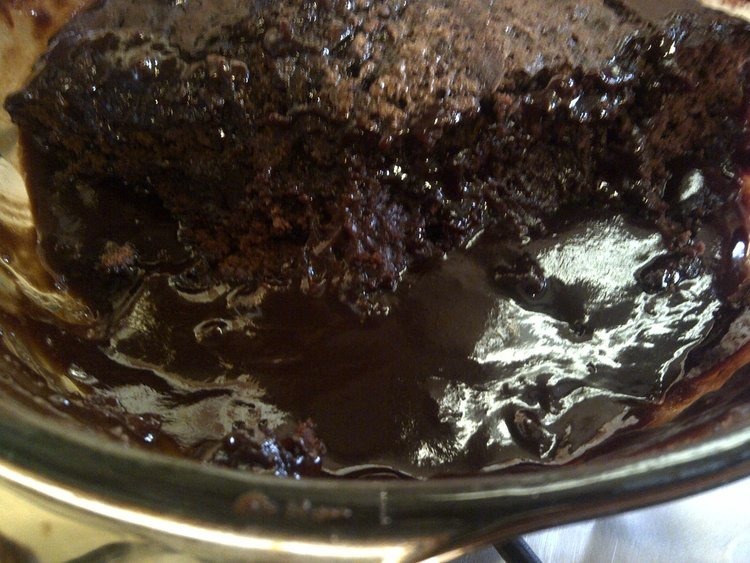 2) In a large bowl, combine 3/4 cup of the granulated sugar, flour, 1/4 cup of the cocoa, baking powder, and salt. 3) Melt butter and add it in to the dry ingredients in the bowl, along with the milk and vanilla. Beat until smooth (Don’t worry if the batter seems stiff, well, you can worry if you want, but it won’t stop your batter being stiff). 4) Pour it into an ungreased baking dish or tin (the recipe says a 9 inch square tin, but I used a round glass oven dish because that’s just the way I roll). 5) Combine the remaining 1/2 cup granulated sugar with the brown sugar and the remaining 1/4 cup cocoa. 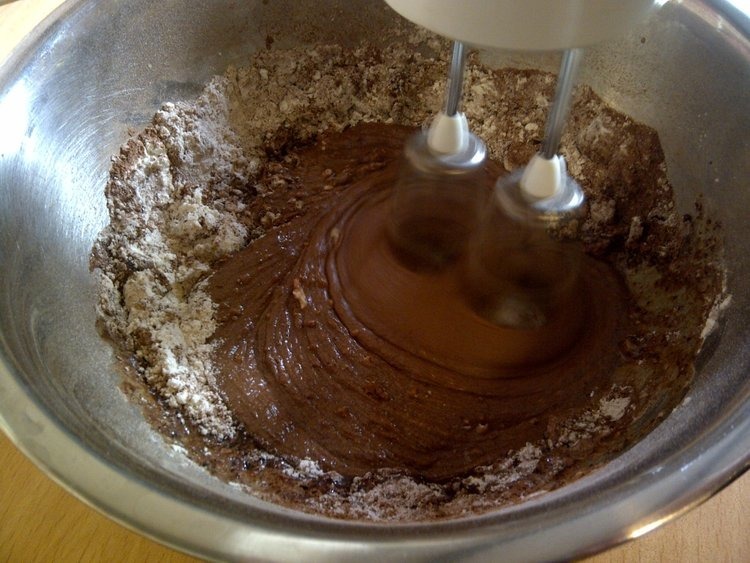 Sprinkle this mixture over the batter. …but you just have to trust in the magic. 7) Bake for 35 minutes, or until the cakey part is cooked (mine needed an extra 5 minutes). 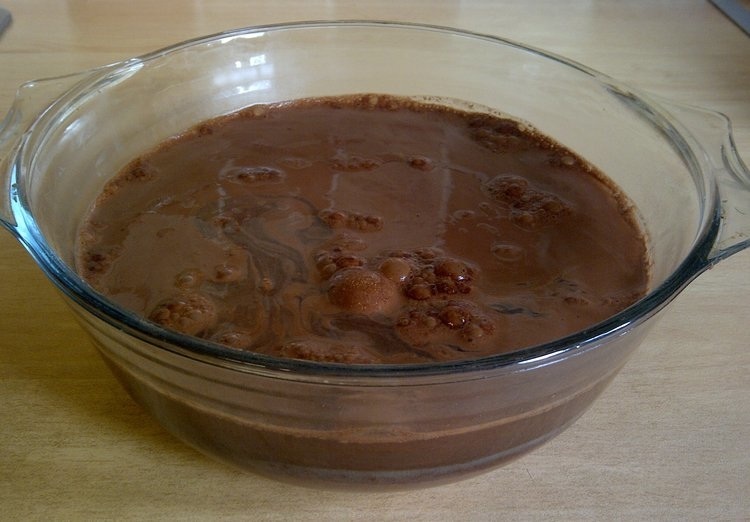 During this time, the cocoa, sugar and water that you put on the top will turn into a beautiful glossy sauce which magically sinks to the bottom. So you end up with sauce on the bottom and cake on the top, oh yes! 8) Leave it to stand for 10 minutes. 9) Serve it warm by dishing it out into bowls and spooning the sauce over it. I recommend serving it with some vanilla ice-cream (even though I didn’t). As much as I like chocolate, I’m not generally a big fan of chocolatey desserts and cakes, but this one seems to work for me! It’s good cold too. Yes, this blog is great for me because I have the excuse of needing to make things like this so that I can post about them! I love the way these are more than just recipes, too. (Don’t worry if the batter seems stiff, well, you can worry if you want, but it won’t stop your batter being stiff). You always bring a smile! Thanks Mayumi, yes, I try and bring a bit of my voice into the recipes too! Thank you for tweeting about it too, that was so sweet, I tried to reply to the tweet, but I was on my phone and I always struggle with Twitter on my phone! Vanessa! It’s Dan’s birthday today and this just might be the key to make his certain to love me for the rest of our lives. Yum and yum and yum. I’m sure he will love you for the rest of your lives even without this recipe, but a bit of chocolate always helps right? Another good thing about this recipe is that it’s made from things that are generally in the cupboard already, so it can be a good spur of the moment dessert! Well pud is short for pudding – here in England, pudding is just another word for dessert, it’s not the same as what you call pudding there. 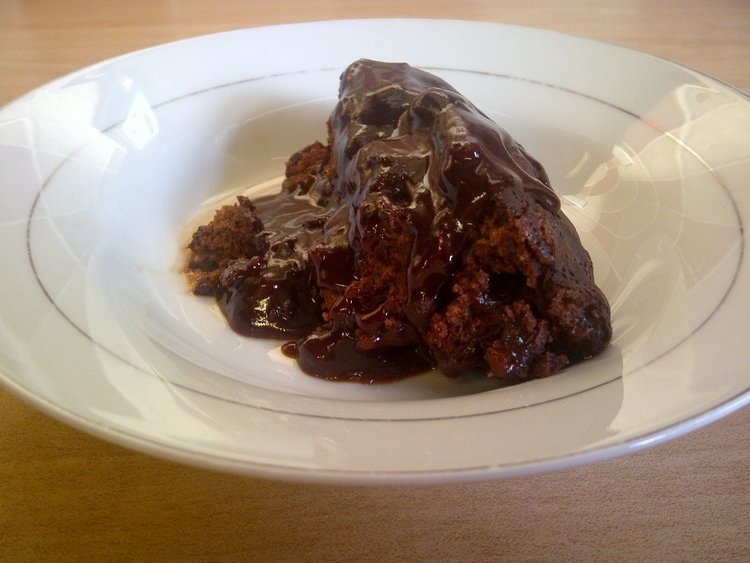 I can’t remember exactly where I got this recipe from, but it was definitely from when I was living in America and I think it was called something like ‘Hot Fudge Sauce Cake’ or something, I gave it the ‘Magic Saucy Hot Chocolate Pud’ name myself! Yes, I lived in Las Vegas for four and a half years, so I can appreciate and understand things from both sides of the pond! Mayumi, this is awesome! 🙂 I can’t tell you how pleased I am to see that not only did you make it, but you did a video of it! On my phone I see notifications when people have commented on my blog, and all I saw yesterday on my phone was that you had said ‘Dee-lish!’ I didn’t notice there was a YouTube until a few minutes ago when I came to the page properly. Thank you so much, I love this!